Allan is the CEO of 4Geeks, which is a really challenging but exciting role in the company. He is always looking forward to create new cool stuff, to improve their skills and share with the team the vision and empowered all people involved in 4Geeks, this is not me saying this, all the team thinks the same way. He is from Paso Canoas, Puntarenas, Costa Rica, in a town near to the border with Panama, which is from more than 400km from San Jose, capital of Costa Rica. Allan has lots of experiance leading companies, in different industries, that’s what He is a key part of the 4geeks team, Allan is the one that leads the company to the success. He writes all of this on his blog so, you can check it out. 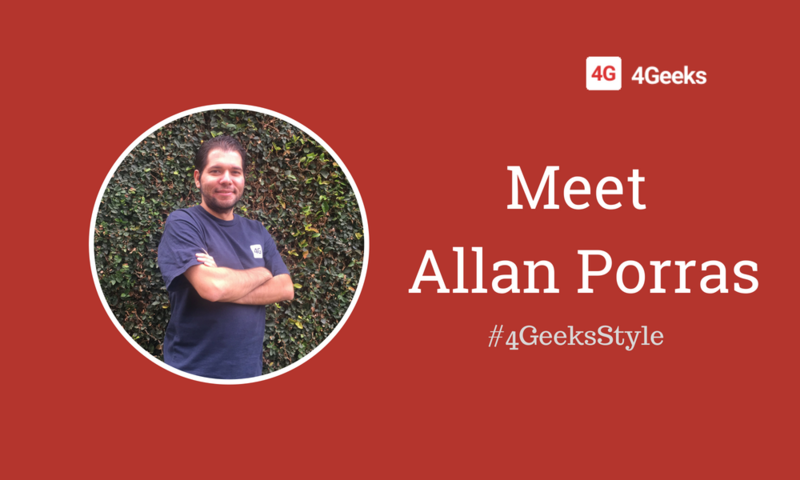 In 4Geeks we love to meet the person, their likes and their ambitions, that’s why we asked some question to Allan to share with the world his thoughts. I love reading, go to cinema, watching movies and traveling. Prison Break and Breaking Bad. Both. I hate routine, and I would like to have good options to choose. Mountain or beach are perfect to me. I’m not a good athlete, but I like soccer and boxing. Actually these are two sports that I play regularly. At the adventure/extreme side, I like rafting. I don’t have any issue to listen any type of music, but I prefer trova, rock and roll, folk, gospel, jazz and blues. Rich dad, poor dad, by Robert Kiyosaki. Unfair advantage, by Robert Kiyosaki. Guide to investing, by Robert Kiyosaki. Sell or be sold, by Grant Cardone. PD: Seems like Allan is not a good cinephile. What is the most excited part of being CEO ? All the company’s errors are mine. All the company’s wins are theirs. My job here is get little wins, to make the team much more trusted in their skills. If they trust themselves, they will happy; if they are happy, they can achieve anything… and then the company grow. Period. What is the most challenging situation you had faced as CEO of 4Geeks ? The most challenge for me has been to merge all the company parts and make it one single thing. Distribute the company vision. I have seen grow to 4Geeks from zero to the today stage, and every single guy here insert their own mark. All of them are different, but if you group them by getting the most brilliant skills, then you get a strong company with strong culture, ready to eat the world. Starting my own real estates portfolio. Teaching people in Latin America the honest way to handle money. Impact millions people with technology products built in 4Geeks. If you run into Allan some day ask him about his goals, you know, some pressure. Do you want to know Allan a little bit deeper? So, you can follow him in the different social networks Twitter, LinkedIn and Facebook. We are doing the same exercise with all the 4Geeks team, so, if you want to know more about the geeks we have at the office subscribe to our newsletter and find out more other content like our #4GeeksStyle, entrepreneurship, life style, technology and business.